One great challenge a designer working in the motion graphics field may encounter is defining the field itself. Having worked as a broadcast designer in cable television and later, when I entered the academic environment, I constantly confront this issue whenever I am faced with the question: What is motion graphics? Invariably, I hesitate, perhaps because I’m unhappy with the most common answer, “the combination of graphic design and animation.” Lack of consensus regarding the definition of motion graphics seems to be commonplace, even an agreement on the term itself is an issue, “motion design” seems to be gaining acceptance (Cone, 2008a and 2008b) as it apparently encompasses a broader range of disciplines such as illustration, interface design, photography and video art. Most definitions are technically-oriented and many assume that animation is necessarily used as a technique when creating motion graphics. However, that assumption is not always true, and there are plenty examples of effective moving graphics where motion has been achieved by means other than animation. One of them is Balsemeyer and Everett’s opening for Jungle Fever (Spike Lee, 1991). The live-action scenes in this feature’s title sequence contain all the typographic elements for the opening credits incorporated into the mise-en-scène of the shots and the motion is due to camera tracking and panning. Another example is the title sequence Saul Bass directed for the feature Grand Prix (John Frankenheimer, 1966), Bass deliberately frames details of the exterior and the cockpit of racing cars as precise geometric compositions, therefore imprinting a stark “graphic” appeal to the footage. The montage of this opening sequence uses different visual artifices, including optical compositing and the repetition of the same image within the frame, resulting in an exceptional example of how motion graphics can be the result of editing and cinematography with a graphic perspective. One attempt to solve the dilemma of definition was to define motion graphics in relation to field of animation, surveying and comparing definitions for both of them. Since it is easy to get caught in clichés such as “animation is a technique used by motion designers,” or looking at motion graphics simply as a commercial application of animation, it seemed logical to try to define both fields simultaneously in different aspects: technical, contextual and historical. The first approach would be to start with an obvious source, for example, the Oxford Advanced Learner’s Dictionary (2015) defines animation as “the technique of photographing successive drawings or positions of puppets or models to create an illusion of movement when the film is shown as a sequence” (n.p.). In the same spirit, I devised the following definition of motion graphics: “the art of combining animation and graphic design in order to convey information and communicate ideas.” Following this logic, we can assume that, in animation, images are captured or generated sequentially in order to mimic reality and motion, therefore enabling the “illusion of life,” and that motion graphics use animation as a technique, enabling graphic designers to communicate ideas in motion. In both cases there is more consideration to the technical process rather than other aspects such as visual language, style, genre and history. One may assume that motion graphics has to be informative or functional and in many cases it is true, and such fact may serve as the premise for one important discussion in this paper: That the constraints imposed by an objective communication brief which require the use of abstract representation may foster more experimentation than in the process of producing animated films. Character animation also can be seen as a mean of communicating ideas or demonstrating principles in other fields of knowledge, such as physics, biology, medical or training in engineering and corporate systems. There are many examples of animated industrial films, where in most cases animation is used narratively rather than in an abstract manner. contemporary term used to describe a broad field of design and production that embraces type and imagery for film, video, and digital media including animation, visual effects, film titles, television graphics, commercials, multi-media presentations, more recently architecture, and increasingly digital/video games (p. 1). To understand motion graphics as a discipline, then, one cannot ignore the discussion of animation as a genre of cinema. Caroline Parsons (2013), in “Why we need a new language of cinema” argues that there can be two distinct definitions of animation: one is that, from technical point of view, “all digital film is technically animation;” the other emphasizes the storytelling aspects of animation, noting that “animation is a specific genre that privileges the unique characteristics of animated storytelling, for example metamorphosis, the transgression of physical laws, anthropomorphosis” (n.p.). However, an animated film can be representative of most film genres: comedy, drama, science-fiction, documentary and can geared to various audiences, on the other hand motion graphics may be present in any film genre, but with the exception of experimental films, motion graphics does not represent a genre. Giannalberto Bendazzi (2004) attempts to clear the misunderstanding of animation of a genre preferring to consider it as a separate style of filmmaking. According to Bendazzi, “many genres exist within animation. This is a good starting point for introducing it not a genre or macro-genre, but as a separate style of filmmaking, a brother to live action cinema” (p. 5). Digital filmmaking has changed not only how we make, distribute and experience films it has also changed the very nature of live-action filmmaking. Lev Manovich (1999) in his article “What is Digital Cinema?” suggests that, in analog cinema, every action has occurred in reality; whether it be fiction or documentary, the camera has captured an act that has taken place in front of it. Conversely, an image may be synthesized digitally and only exist in a virtual environment; therein lies the essence of digital film. Considering the new paradigm of digital filmmaking, we can find that the boundaries between animated film and live-action become increasingly blurred. It is rare today that a “blockbuster” movie will not rely on synthetically-generated images for its special effects. The widespread use of computer-generated imagery is so common that becomes inevitable that we begin question the distinction between animation and live-action. Given that motion graphics and visual effects artists creating virtual worlds are so closely related in their professional practice, it is no surprise that designers are embracing filmic storytelling in disciplines such as architecture, interactive design and product design. Considering that animation is the result of frame-by-frame generation of images, in a digital context they can be either created sequentially by digitally sampling analog methods, or generated by manipulating digital objects and then rendering the applied actions. Digital animation tools mimic traditional animation techniques, ink and paint programs replicate the analog techniques, and even 3D animation can be seen as a digital counterpart of a stage for stop-motion animation. When we think of digital animation tools with the purpose of creating narrative films, we thus must deal with metaphors that represent the original traditional techniques. Motion graphic designers approach these tools in quite a different fashion, however – since it is common to deal with abstract concepts instead of linear storytelling, there is a more experimental attitude regarding the use of software: random results, glitches and mistakes are generally welcome. In the early days of computer graphics, animation software did not find many adopters within the animation community because it didn’t meet their expectations. Meanwhile, in the early days CGI systems found a demand by broadcast designers using the TV screen as a “canvas,” a low-resolution medium and therefore very forgiving. For that reason, and others, such as the immediate results obtained in CGI animation, television designers widely adopted these new tools at an early stage of development. One of the main processes in creating motion graphics digitally is the use of key framed based manipulation and compositing of moving images, a set of techniques that has it’s origins in the electronic digital video effects systems introduced in the 1980s such as the ADO and the Mirage. These systems created by engineers who rarely received feedback from designers and artists during their development, and for a long period where only accessible to technicians with limited or no artistic background. Cable television, and most notably the young network MTV, enabled broadcast graphic designers and video-artists to access them by introducing layering and image processing into video post-production, creating a novel visual style adopted by music videos, a format where experimentation was both welcome and expected. Motion graphics can be seen as designers’ creative response to technology. In abstract films of the early 20th century, we realize how visual artists adopted the techniques of analog cinema in order to explore modernist visual experiments in motion. Later, television graphics relied on electronic video effects to animate graphics and currently digital film software provides a virtually unlimited toolset for motion graphic artists, allowing endless possibilities in the creation of moving images. 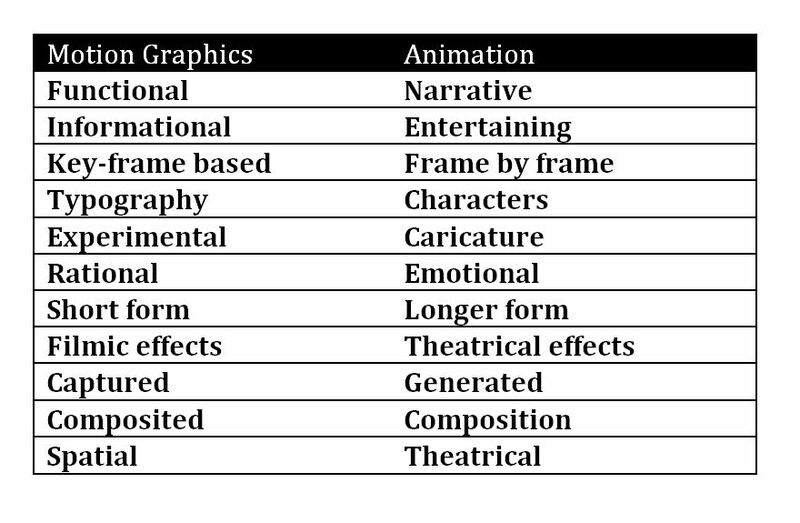 Animation and motion graphics, one option was to tabulate comparative attributes of both fields, many of which have been exaggerated for argument sake and may be easily refuted, however may help us create a framework for discussion (Table 1). As the task of defining motion graphics may still be inconclusive at this point, one may resort to understand and define motion graphics as an independent discipline by tracing its history. Motion graphics or typographical animation has been used by the film and television industry for decades in order to present and promote movies and TV shows. While this industry has adopted traditional animation techniques in its arsenal of tools, it is also known for pioneer research and development of new techniques, mainly in computer graphics. The history of motion graphics can be traced back one hundred years, having its first examples in the work of modernist avant-garde movements(Table 2). In the first half of the 20th century the field was not considered a subject itself, being identified with experimental work of artists, animators and programmers. During the first three decades of the last century, artists and filmmakers such as DzigaVertov, Walter Ruttman and Man Ray experimented with film, light, shapes and sound, teasing our perception. Later in the 1940s and 1950s, Norman McLaren, Oscar Fischinger, Len Lye and James Whitney conducted extensive work on animating abstract forms, becoming more and more minimalist and geometric; attention should be given to sound as an important aspect of the production of this period resulting from similar “concrete” experimentations, the relation between sound and motion graphics established in the period remains a cornerstone of the art until today. Similarly, Saul Bass is one of the most influential designers pioneering the use of moving graphics as applied to film titles. His work still inspires generation after generation, consolidating the art of the title sequence as part of the film culture. Bass established a close creative relationship with directors such Alfred Hitchcock and Martin Scorsese among others, demonstrating that an opening sequence may not only become a memorable and vital part of a larger film, it may be read as a film in and of itself – a film that has many functions: dialoguing with the main feature, conveying a hint to the story, engaging the viewer who is still not completely concentrated in his seat, as well as the more mundane task of presenting the credits and the title of the film being shown. Pablo Ferro and Maurice Binder are contemporary to Saul Bass and deserve due consideration as well. Ferro conceived the opening for Dr. Strangelove (Stanley Kubrick, 1964); in this sequence a “proto-sexual” interaction occurs between a B52 bomber plane and a Boeing jet attached to one another in a refueling operation. Although the titles have no animation, it is considered one of the landmark title sequences in the history of motion graphics. Binder is similarly known for the opening credits for James Bond movies, landmark icons of film history. Titles sequences can be considered an art form in their own right. “Forget the film, watch the titles” is a website dedicated to the field, and the title could not be more suggestive of how important movie title sequences have become. Technical advances in the 1970s such as motion control and optical effects took the art of film graphics to a new level. R/GA Robert Greenberg and Associates’ studios in New York created many of the most memorable title sequences of this period, the opening credits for Superman (1978), Alien (1979) and The Untouchables (1978), among other examples, all inhabit our filmic memories as cultural touchstones. The Quantel Paintbox became the landmark platform for the production of television graphics in the 1980s. It was a very expensive system, so with the exception of music videos and advertising, there was a lack of creativity in the period, particularly in network television. British designer Martin Lambie Nairn was a notable exception, and took the broadcast design profession to a new level. His work for the BBC, Channel 4 (Lambie Nairn, 1997), and many other networks was conceptual and highly well executed, raising the bar for a whole generation. One of the most important changes, however, came with the introduction of cable television, which opened the doors of the stations to a new generation of designer. In the early days, the graphics facilities at TV networks were staffed predominately by unionized technicians who were very protective of their trade. Cable television not only invested in the equipment or hired facilities in order to produce on-air promos, they also believed that by hiring artists and creative talent, they would be able to compete with network television. MTV is a significant example of this strategy, which opened a whole new scenario for designers and artists willing to experiment visually on television – animators, graffiti artists, video artists gained the possibility to explore a new medium using animated visual effects. In the 1990s desktop video systems revolutionized the market. The introduction of more affordable computers such as the Macintosh and Silicon Graphics Indigo enabled compositing software packages Cosa After Effects, Matador and Flint to be installed on non proprietary systems, allowing “Design Boutiques” to compete with big post houses and opening the doors to experimentation by designers who now use the tools themselves. Today motion graphics has established itself as a field of work, its boundaries with animation, special effects and user interface design are loose, while dialoguing with all these fields, and it has consolidated as a design discipline that has become more ubiquitous as we see motion involved in electronic displays surrounding us. For the past ten years, I have been teaching motion graphics and animation to film students as two separate disciplines and was quite clear about which subject matter pertained to each course. Since 2004, I have taught Electronic Graphics to undergraduate film students at University of São Paulo (USP) in Brazil. In 2009, I began offering a motion graphics course to design students at FAU USP, an architecture school with a modernist orientation at the same university and I was impressed by how the output from the design students was completely different from the film students, even though the subject matter was the same. Meanwhile at USP’s School of Communication and Arts, where I also teach an introductory animation class in the film and television department, the undergraduate curriculum was being reformed: the film, radio and television courses merged into the Audiovisual Program. In the process it was requested that the animation course become an elective for the second-year students and that motion graphics had to be taken by all freshmen. I was initially resistant to the idea, believing at the time that animation should be a pre-requisite for motion graphics. Time proved me wrong, however, and the sequence of the courses made no difference in the final output or the ability of the students to produce the final project. Film students at ECA USP the Communication and Arts School, seemed to prefer to concentrate on illustrating a story, choosing techniques and styles based on the selection of references they shared collectively or that I presented in class and rarely set themselves to research new forms of visual language. On the other hand, design students have more difficulty with story telling and the temporal aspects of audiovisual communication, a fact that is countered by a broader visual arts repertoire that allows for more opportunities for experimentation. The design school does not always fully comprehend the importance of motion graphics within the design curriculum and tends to place the field within the realms of Graphic User Interface Design; whereas the Film and Television Department where I teach at the communication and arts school either consider it as part of the post-production process, and emphasize the technical aspects. The University is highly compartmentalized in this respect, and although there are theoretical discussions emphasizing the importance of an interdisciplinary curriculum, the practicality of cooperation between departments and schools is very limited. Teaching motion design and animation to both film students and graphic design students, I have realized that the background in audiovisual production of one group and the design skills of the other are equally important. Integration of academic curricula of both programs is much needed in order to advance education in the field. The same can be said regarding the cooperation of research conducted by animation professionals and motion graphic designers, to do so, it would be helpful to better define these disciplines. I have found that motion graphic artists venture into visual experimentation as a response to the objective aspects of communicating and displaying information inherent to the work. The rational aspect of the message can be easily displaced from context and is free from narrative, this can be perceived both in professional work as seen in a historical examples and from my experience with undergraduate students. A range of new platforms such as social media, digital film, transmedia and video games are becoming established as a primary means of producing and distributing audiovisual content today. The boundaries between art, design and technology are being re-defined, and animation and motion graphics play an important role in this scenario, gaining an importance not only as genres of communication but also as tools for human computer interaction. Digital media allows designers to use of animation to convey time based visual messages where static images have traditionally been used. With the growth of the field of motion graphics, this industry can benefit from the interaction of research conducted in design and animation. This paper was presented at the Society for Animation Studies annual conference in 2014 (The Animator Toronto, June). Dr. João Paulo Amaral Schlittler is a Professor in the Department of Film, Radio and Television(School of Communication and Arts) at the Universidade de São Paulo in São Paulo, Brazil. “Animation.” Oxford Advanced Learner’s Dictionary. (2015). Retrieved from: http://www.oxforddictionaries.com/definition/english/animation [Accessed 17th May 2015]. Bendazzi G. (2004). Defining Animation – A Proposal. Retrieved from: http://giannalbertobendazzi.com/wp-content/uploads/2013/08/Defining_Animation-Giannalberto_Bendazzi2004.pdf [Accessed: 23rd June 2015]. Belantoni, J.; Woolman, M. (1999). Type in Motion: innovations in digital graphics. New York: Rizzoli. Betancourt, M. (2013) The History of Motion Graphics: From Avant-Garde to Industry in the United States,. U.S.A.: Wildside. Cone, J. (2008a) “Apart from an occasional post-sneeze blessing, I don’t speak German.” Stash – Motion Graphics 1: 4-5. Retrieved from http://www.stashmedia.tv/pdfs/coll_MG_booklet_screen.pdf [Accessed: 14th July 2014]. —. (2008b) Motion Graphics” or “Motion Design? Retreived fromhttp://motionographer.com/2008/10/24/motion-graphics-or-motion-design/ [Accessed: 23rd June 2015]. Drate, S., Robbins, D. And Salretz, J. (2006) Motion by Design. United Kingdom: Laurence King. Grand Prix 1966. [65mm Film]. Directed by John Frankenheimer. Title Design by Saul Bass. USA : Cherokee and Metro-Goldwyn-Mayer. Heller, S. And Dooley, M. eds. (2008). Teaching Motion Design: Course Offerings and Class Projects from the Leading Graduate and Undergraduate Programs. New York: Allworth. Dr. Strangelove or: How I Learned to Stop Worrying and Love the Bomb 1964. [35mm Film]. Directed by Stanley Kubrick, Title Design by Pablo Ferro. USA/UK: Columbia Pictures. Lambie Nairn, M. (1997). Brand Identity for Television with Knobs On. London: Phaidon. Jungle Fever (1991). [35mm Film]. Directed by Spike Lee, Title Design by Balsemeyer and Everett. USA: Universal Studios. Manovich, L. (1999). “What is Digital Cinema?” Retreived from: http://manovich.net/index.php/projects/what-is-digital-cinema [Accessed 17th May 2015]. Parsons, Caroline. 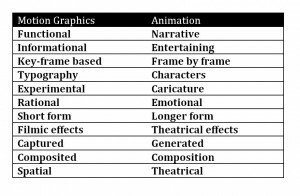 “Why we need a new language of cinema.” Animation Studies 2.0. Ed. Nichola Dobson. Retrieved from http://blog.animationstudies.org/?p=397 [Accessed: 23rd June 2015]. Sandhaus, L. (2006) “Los Angeles in Motion: A Beginner’s Guide from Yesterday to Tomorrow.” Retrieved from: http://www.lsd-studio.net/writing/lainmotion/pdfs/LA_in_Motion.pdf [Accessed: 23rd June 2015]. Soar, M. And Hall, P. (2006). “Images over time.” Eye Magazine 60. Retrieved from: http://www.eyemagazine.com/feature/article/images-over-time [Accessed: 23rd June 2015]. This entry was posted in João Paulo Amaral Schlittler - Motion Graphics and Animation, Volume 10 and tagged animated typography, animation techniques, brodcast design, film titles, motion graphics. Bookmark the permalink.